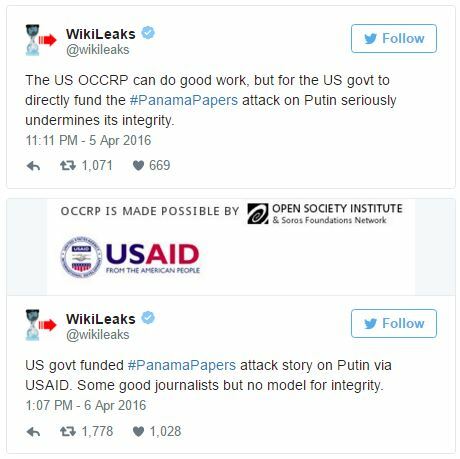 Washington is behind the recently released offshore revelations known as the Panama Papers, WikiLeaks has claimed, saying that the attack was “produced” to target Russia and President Putin. 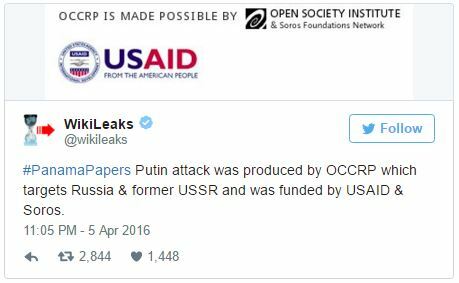 On Wednesday, the international whistleblowing organization said on Twitter that the Panama Papers data leak was produced by the Organized Crime and Corruption Reporting Project (OCCRP), “which targets Russia and [the] former USSR.” The “Putin attack” was funded by the US Agency for International Development (USAID) and American hedge fund billionaire George Soros, WikiLeaks added, saying that the US government’s funding of such an attack is a serious blow to its integrity. Organizations belonging to Soros have been proclaimed to be “undesirable” in Russia. Last year, the Russian Prosecutor General’s Office recognized Soros’s Open Society Foundations and the Open Society Institute Assistance Foundation as undesirable groups, banning Russian citizens and organizations from participation in any of their projects. “The American government is pursuing a policy of destabilization all over the world, and this [leak] also serves this purpose of destabilization. They are causing a lot of people all over the world and also a lot of money to find its way into the [new] tax havens in America. The US is preparing for a super big financial crisis, and they want all that money in their own vaults and not in the vaults of other countries,” German journalist and author Ernst Wolff told RT. 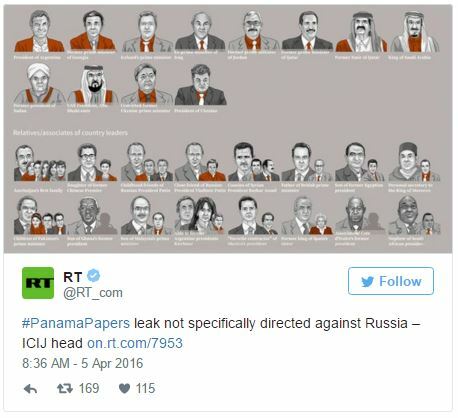 Earlier this week, the head of the International Consortium of Investigative Journalists (ICIJ), which worked on the Panama Papers, said that Putin is not the target of the leak, but rather that the revelations aimed to shed light on murky offshore practices internationally. “It wasn’t a story about Russia. It was a story about the offshore world,” ICIJ head Gerard Ryle told TASS. His statement came in stark contrast to international media coverage of the “largest leak in offshore history.” Although neither Vladimir Putin nor any members of his family are directly mentioned in the papers, many mainstream media outlets chose the Russian president’s photo when breaking the story. “We have innuendo, we have a complete lack of standards on the part of the western media, and the major mistake made by the leaker was to give these documents to the corporate media,” former CIA officer Ray McGovern told RT. “This would be humorous if it weren’t so serious,” he added. “The degree of Putinophobia has reached a point where to speak well about Russia, or about some of its actions and successes, is impossible. One needs to speak [about Russia] in negative terms, the more the better, and when there’s nothing to say, you need to make things up,” Kremlin spokesman Dmitry Peskov has said, commenting on anti-Russian sentiment triggered by the publications. “When they are saying that this is responsible journalism, I totally disagree with the overall tone of that,” the co-founder of the Icelandic Center for Investigative Journalism told RT’s Afshin Rattansi in Going Underground, when asked about his reaction to the ICIJ head saying that the consortium is not WikiLeaks, and is trying to show that journalism can be done responsibly by not releasing the papers in full. “They should be available to the general public in such a manner so everybody, not just the group of journalists working directly on the data, can search it,” Hrafnsson said. 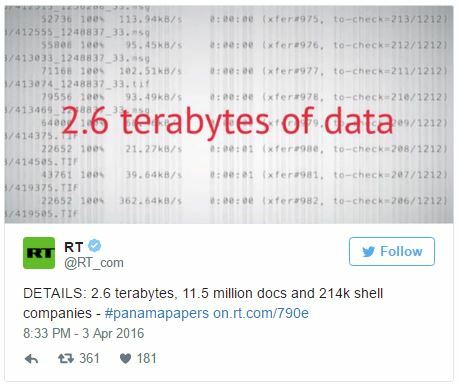 The WikiLeaks spokesman also told RT he’s not surprised that there have been no big American names in the leaked 11.5 million documents of the Panamanian law company.